6 teams from Dulwich International High School Suzhou took part on The World Scholar's Cup on Sunday 3rd March. 5 of them qualified for the global round! What is The World Scholar's Cup? Founded by Daniel Berdichevsky, the first World Scholar’s Cup took place in Korea in 2007. It was a small regional tournament hosted at the Hankuk Academy of Foreign Studies. The first “global” round followed a few weeks later, bringing together students from Korea, Singapore, and the United States. 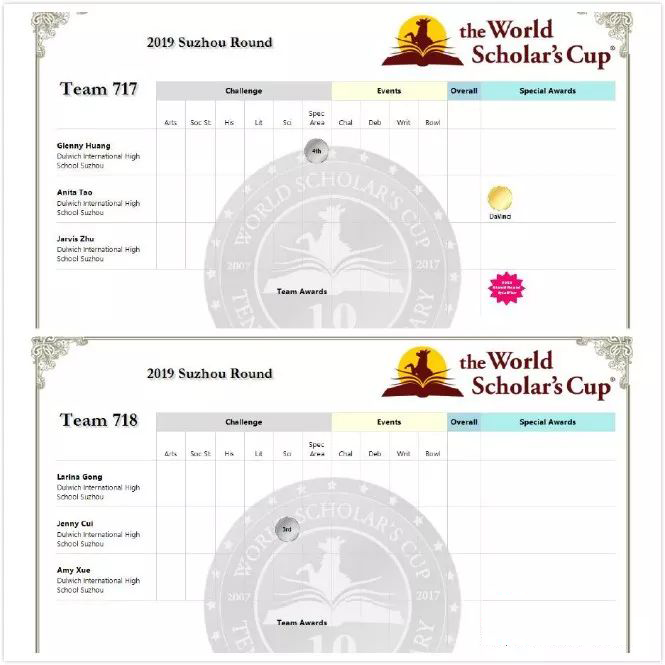 The idea behind the World Scholar’s Cup was to create something different compared to traditional academic competitions and conferences: a celebration of the joy of learning, a tournament as rewarding for the team that came in last as the for the team that came in first, an enrichment opportunity that motivated students not just to demonstrate their existing strengths but also to discover new ones. The scholars' bowl - Every team in the theater. Every team with a clicker. Every question harder than the one before. Your team works together to solve analytic questions and multimedia challenges. Click your answers before time runs out, and don’t be surprised if you’re asked to connect a poem you studied to a clip from Game of Thrones. Collaborative writing - You’ll be given six statements, each from a different subject area, and asked to choose one to argue for or against. You’ll first have 30 minutes to prepare with your teammates, then an hour by yourself to compose the most persuasive essay possible, then 15 more minutes to work together at the end. Here’s the catch: each member of your team has to choose a different topic. The scholars' challenge - its multiple choice, so make multiple choices. The Challenge looks like any other test, but with an alpaca-powered twist: you can mark more than one answer per question. The fewer you mark, the more points you can earn if you’re right. (Yes, that means you can finally guess C and D... and also A, B, and E.) Apply your knowledge of the six subjects successfully and you can win medals in one, two, or all of them. You’ll soon discover what all World Scholars do: that even if you think you’re an expert in science, you might win a medal in the arts, and that the best way to prepare for a test that touches on everything is to talk through it all with your team, day by day. The team debate - Each team debates three times, on motions across all the subjects, from policy to poetry. You may be arguing whether parents should have access to surveillance cameras at schools—or whether women make better superheroes. Debate is your chance to apply all that you’ve learned to make the most persuasive case you can. And, win or not, after each debate, you’ll give the other team feedback on how to improve. Last year our team won medals, either silver or gold, in all of the 4 categories. And it’s worth mentioning that this is the first time we have won a medal in the team debate, in which they, as second language speakers, had to compete against scholars worldwide, with the majority of whom speak English as their first language! Two of our Year 12 girls went to Yale for the final round of World Scholars Cup, Katherine H., and Sherry J. They won medals in team writing, team bowl, scholars' challenge, and team debate. The World Scholar's Cup gives students a good opportunity to communicate with their peers around the world. Mr. Meyer and Mr. Hodgkin, who are in charge of organizing this event for Dulwich International High School said that students can build confidence in the event and improve their English expression ability by competing with excellent peers and native English speakers. "To be honest, the World Scholar's Cup is the best competition I have ever participated in and I am glad I didn’t miss it. It is not only about practicing debate and writing skills (which are certainly important to me), it is also about cooperation and being part of a big family. At first, I thought it would be embarrassing to debate with the people you just met a few minutes ago, but no! Instead, I enjoyed every minute and have met many people who are passionate about debating and share the same interests. I have participated in many competitions, but this is the only one that I would like to be involved as long as possible." ——Anita T.
Please congratulate them if you see them or teach them!